Business tool first, but could it change the face of search? 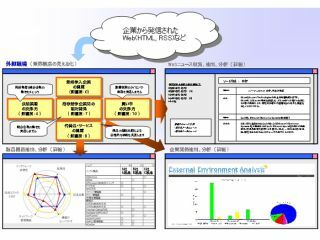 An unusual new piece of software announced today by NEC Japan is intended for businesses seeking a competitive advantage over rivals. But - if it reaches full potential - it could redefine internet searching instead. The ' Virtualization Technology' automates many of the tasks that a human market researcher may be called upon to perform when looking into a particular product area, such as how competitors market their goods or what people are saying about them. It does this by "cruising RSS and web pages ... and picking out corporate information and product features". Throw in automated analysis of press releases from other firms in the same field and you get a system that frees up staff to perform less monotonous tasks. According to NEC, the software can shorten product-planning lead-time by up to two-thirds. And, considering its web-centric nature, it clearly has applications in other areas, such as product comparison on shopping websites or even more intelligent general search techniques. For now, though, we'll just have to wait for the software to reach our side of the table. An NEC Japan spokesperson told us, "This is still in development ... so we cannot say whether it could be expanded to consumer applications". Our money's on yes.